The first time I flew to London--or anywhere overseas, for that matter--I was in college, on my way to study for a month in Oxford. My classmates and I would take the train from Oxford to London for the night or to spend the afternoon drinking at pubs along the Thames when our intentions had been to visit museums. Oops. I returned twice as an adult. Once on my way to Bournemouth for a friend's wedding and once again as a pitstop between Madrid and Paris. While I squeezed in a tourism mainstay at one point or another, my experiences were largely informed by the locals. I stayed at Shoreditch House in East London or with friends in the Queens Park area or in Islington. We strolled through Notting Hill to eat a Pizza East or I jogged along Southgate Road, popping into De Beauvoir Arms for coffee and lunch. This last time, however, was another story. My mother hadn't been overseas since college. My brother would be teaching in London for three weeks, his family in tow. The situation was primed for Operation Get Mom Overseas. We agreed that we'd pull out all the stops--Buckingham Palace, The London Eye, St. Paul's Cathedral!--and we did. 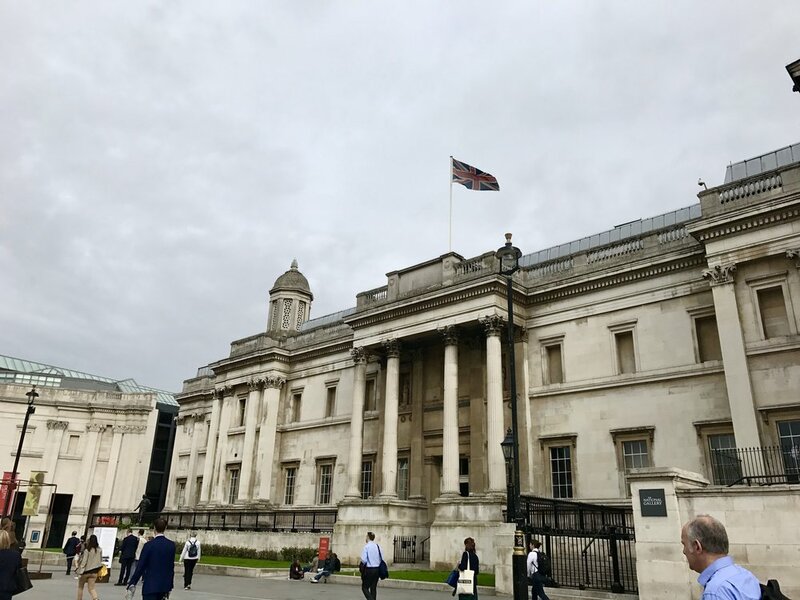 As a frequent traveler and longtime urban dweller, I was nervous about being thrust into the London equivalent of Times Square on a daily basis, but with the right amount of planning and pace, we make it work seamlessly. This may seem like an overwhelming amount of things to do on Day 1, but the five-hour flight from the east coast isn't long enough for a sufficient night's sleep. The key staying awake? KEEP MOVING. Even better if you can be outside. First stop: The Admiralty for lunch. After living in NYC, I assume all food near a major tourism center is total crap. And often it is overpriced, mediocre food aimed to lure exhausted tourists by way of convenience. But the award-winning steak & ale pie at The Admiralty hit the spot and we didn't have to wait for a table. Works for me. Because we stayed in Leister Square, just by Trafalgar Square, we had immediate access to The National Gallery. While crowds abound, museums can be a great way to stay awake after a long flight because they demand your engagement. If the art starts running together due to jet lag, I recommend grabbing a green tea from the café on the bottom level. St. James Park is a gorgeous expanse located next to Buckingham Palace. 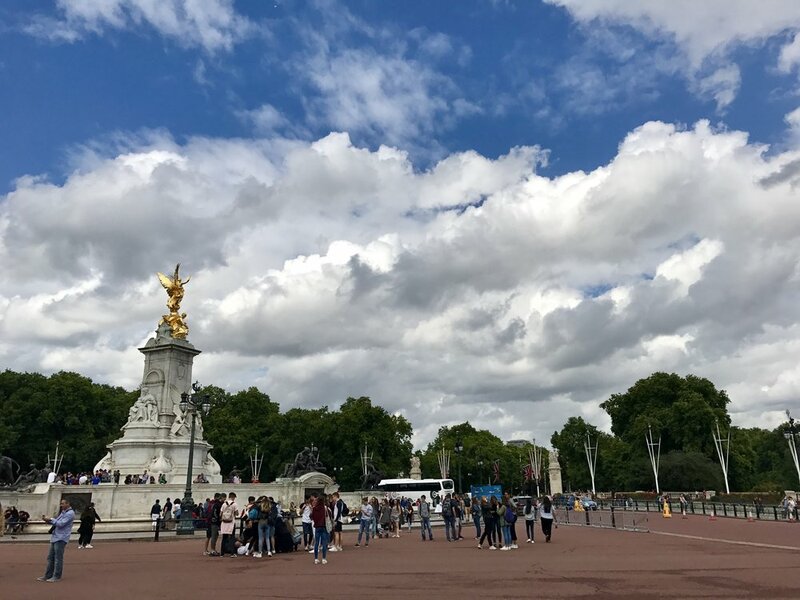 On our way to visit the Queen, we took a stroll through gorgeous gardens, over ponds, and had the option to break at any number of ice cream stands or the St. James Café. At Buckingham Palace, we soaked up the sights, marveling at the immaculately kept lawns and statues. I'll admit that I was not wild with excitement to ride the London Eye. At first glance, these types of tourist attractions, overrun by screaming children and baffled adults, generally give me great anxiety. But mom reassured us with the promise of Champagne and "special tickets." The Eye Lounge & Champagne Experience was worth all 40 pounds, people. As soon as we arrived, we checked in and went to the lounge, where we each got a glass of Champagne. It's not the world's finest, but hey--it got the job done. After about 15 minutes, a host collected whomever was in the lounge (those who paid for the same experience) and escorted us downstairs. We then skipped the long lines and were led to our very own pod, just the 12 of us. Inside the pod, our host poured us more Champers and answered our many questions about the buildings within eye's reach. If you're considering The Eye, my advice is to fork up the extra cash. Our day began with an ornery cab driver with a cockney accent, enraged by yet another bike race in London, which blocked off many of his routes. He got us as close to St. Paul's as possible, apologizing to my brother, "I have to drop you off here, young man. I can't go any further. Or else I'll lose the will to live." We didn't take the stairs to the top of St. Paul's, but it was nonetheless awe-inspiring. I relished our time at the Tate, as I generally prefer contemporary art museums over classical galleries. For dinner we were pleasantly surprised (once again) at how good the food was at Carluccio's. From there, we headed to the Globe to see Much Ado About Nothing. I'm 34 years old, have seen my fair share of Shakespeare (in England, too) and this was the first time I truly understood everything that was happening. It's a total tourist situation, but The Globe exceeded our expectations. While my family continued touristing at Kensington Palace, I slipped away for some QT with some of my girlfriends. We lunched at a spot in Old Spitalfields (perfect for those who love a market) and then strolled through East London. We meandered through the Columbia Road Flower Market, admiring every kind of succulent and flower imaginable, and popped into the cutest shops along the road. The pièce de résistance of our trip, however, came that night at The Ivy in Covent Garden. New Yorker friends living in London recommended the spot, and I needed a location within walking distance to our hotel. It was gorgeously decorated, the service was impeccable, the food was good, and the cocktails were exceptional. It's an old-school standard, so don't expect to be wowed by innovations in modern cuisine. But as far as consistency goes, The Ivy is excellent. "Whatever y'all want!" I said. "I'll go anywhere," I agreed. This trip was not for me, so I was completely comfortable with being along for the ride. Except that I had one demand: to dine at Sketch. The pink room is the stuff all my dreams are made of and I wasn't going to leave London without a visit there. Conveniently, they serve afternoon tea in the pink room. (There are five restaurants and bars within Sketch.) Featuring pink walls, plush pink upholstery, metallic trimmings, marble chevron floors, and a wait staff dressed to the nines, the pink room at Sketch transcends campy, landing somewhere between thought-provoking and downright fantastical. And these were the highlights of our London trip. It was jam packed with plans each day and almost entirely the antithesis of what a local might add to your list of To Do List, but it was an epic way to tourist the town. Got any more recs? Leave a comment and let me know! I'm sure to be back in London soon enough and would love new sights to see.